Fourth-seeded Michigan State’s seniors become the first four-year players recruited by Tom Izzo to fail to reach the Final Four. 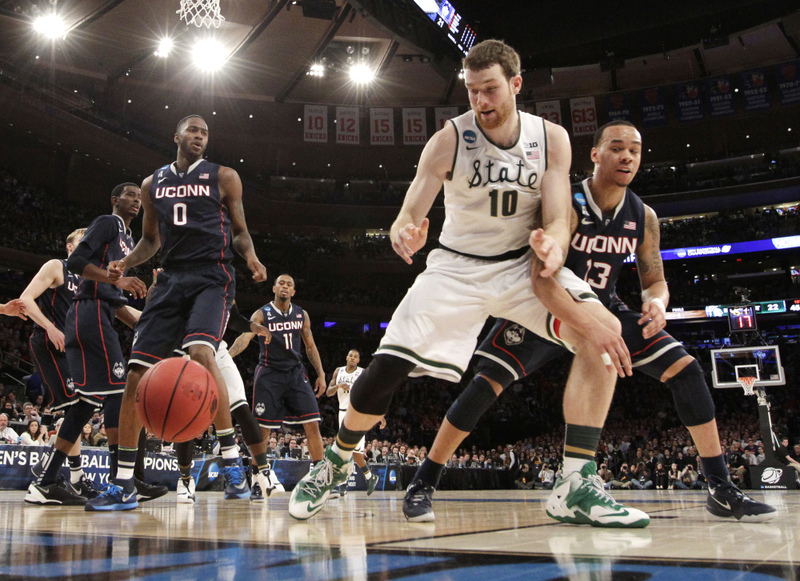 NEW YORK – Shabazz Napier scored 17 of his 25 points in the second half, and UConn beat Michigan State 60-54 to return to the Final Four a year after the Huskies were barred from the NCAA tournament. Napier, the East Regional’s most outstanding player, hit three huge free throws with 37.6 seconds left at Madison Square Garden to carry UConn to the Final Four just as Kemba Walker did in Napier’s freshman year. Fourth-seeded Michigan State’s seniors become the first four-year players recruited by Tom Izzo to fail to reach the Final Four. Gary Harris led the Spartans (29-9) with 22 points. The undersized Huskies matched Michigan State’s physical play box-out for box-out, holding the Spartans to just six offensive rebounds and six points in the paint. UConn dared Michigan State to shoot 3-pointers, and the Spartans nearly made enough, going 11 for 29 from behind the arc. After Payne hit a pair of free throws to pull the Spartans back within two, Keith Appling was called for a foul on Napier’s 3-point attempt. The senior extended the lead to 56-51, and after Travis Trice missed a 3, Michigan State couldn’t get to UConn to foul. Phillip Nolan slipped free for a dunk that clinched the victory and had thousands of Huskies fans in the Garden leaping up and down. 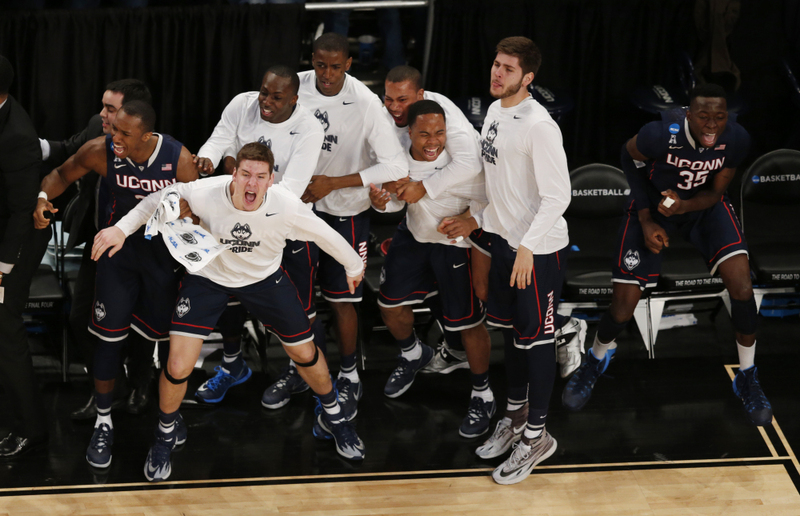 UConn won its third national title in 2011, but the Huskies were ineligible for last year’s tournament because of previous low scores on the NCAA’s academic progress measure. Ryan Boatright made four steals as UConn used its quickness to force 16 turnovers. DeAndre Daniels shut down Branden Dawson, who scored 24 points in Michigan State’s Sweet 16 win over top-seeded Virginia. Dawson attempted just three field goals, making one, to finish with five points. After hitting four straight free throws to tie the score at 32 with 12:38 left, Napier was struck in the face by Gary Harris – the UConn guard was called for a foul on the play – and left the court with his nose gushing blood. He was back less than minute later when Daniels completed a three-point play to give the Huskies the lead for good.